When we were enjoying that wonderful weather back in April, the old saying, “Oak before Ash expect a splash, Ash before Oak expect a soak; well in most of the South West the “Ash was out well before the Oak, and from what we have seen this summer, the rest of the Country as well, and if anyone didn’t believe in old country folklore before, I’m sure they will now, because have we had a SOAK! The effects from that atrocious weather had disastrous effects for hay and silage making and at one stage cereal crops, as well as many one day shows being cancelled. Luckily August improved for the hay, silage and cereal harvest, then the next bomb-shell, Foot and Mouth struck, so that put the show season to an end for livestock. Not only is it devastating from the show finances, also for the exhibitors, as we miss catching up with friends, and the competitive side, and our shop window to promote our stock. Our herd visit to Peter Burgess, Tillbrook herd in August was another event to fall by the way-side, disappointment yet again. Enough gloom and doom. Members (though thin on the ground) enjoyed an arousing talk of his life and work, by a local vet. Marjorie Ellicott organised a quiz for members, 3 teams took part, a lot of fun, ignorance and frustration was enjoyed by all. At the A.G.M. in March, A. Grossey wished to stand down from the Committee, Len Curvey accepted the vacancy. Mr. Derek Mead was the speaker at the dinner following the A.G.M. The Bristol Sale proved a success, as Richard Pringle was moving on from Stags, the Club presented him with a Simmental figure in appreciation of his work at our sales. 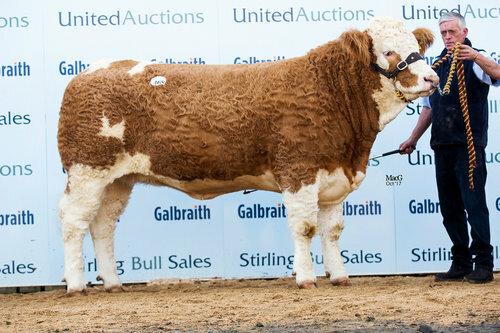 Champion Male was Sterling Samson from Boddington Estates, sold for 2,000 gns. Reserve Champion and top price Bull was Tilbrook Turpin from P. Burgess and sold for 3,100 gns. Cliftonswood Beauty 4th from H. Brown was Female Champion and sold for 3,100 gns. Wishful Sunbeam from D. & C. Mills was Reserve Female and sold for 2,500 gns. Mr. & Mrs. A. Grossey’s Shellthorn herd was dispersed. The cattle were a credit to them, for their presentation and condition and it reaped its reward with Shellthorn Hannadante 6th selling for 8,000 gns to L. & A. Currie, top price Bull was 3,500 gns. I am pleased to say Andy & Di’s boys are setting up their own herd; Lower Sea as their prefix, with 2 females not forward at the Sale. Very few shows took place, as you can see in the Results section. Thanks to the team again for setting up, manning, and providing refreshments at the Devon County Show. To round the year off we visited Miss Francis’s Dinton herd on Sunday 7th October.